Figure 6-1: A galactic spiral calculated via equation 4-1-1a using the parameters , , , , , and . 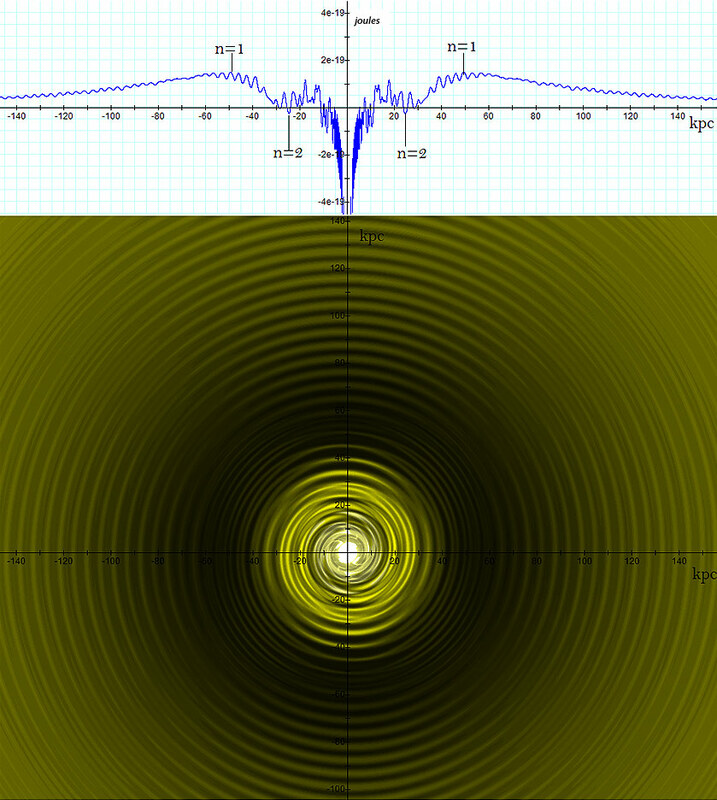 The lower image provides a two dimensional map of the potential energy contours of an ordinary particle of mass , while the upper image of the figure displays its potential energy curve along the axis. As shown, the spiral structure does not end at the last significant minimum contour located at a radius of approximately , nor at the external zonal maximum located at a radius of approximately to , and is demonstrated to extend well beyond these major zones. Note that as the distance between the ordinary test particle and the center of the galaxy increases beyond the maximum, the particle�s potential energy declines gradually and eventually converges toward the Newtonian potential energy. 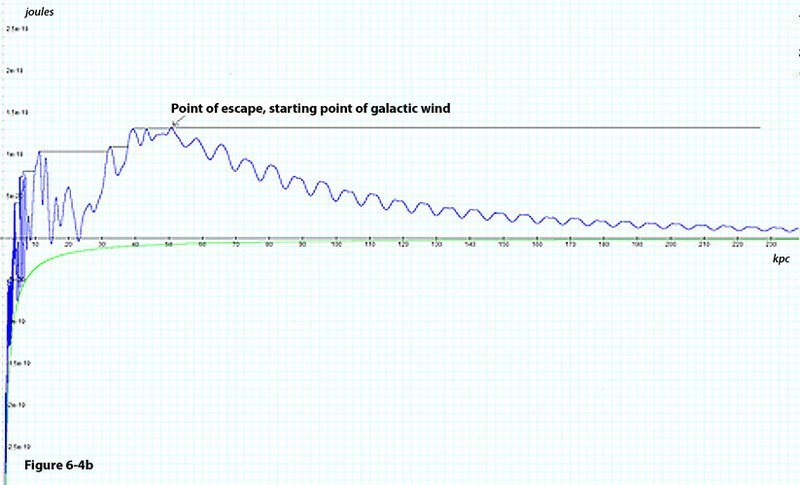 When the rotation of the spiral is viewed over time, the oscillations displayed in the upper graph migrate outward, suggesting that the orbiting ordinary particles may be led outward by the rotating spiral, and eventually ejected out of the galaxy in the form of galactic wind. The purpose of this chapter is to further explore the interaction between ordinary matter orbiting around the center of a spiral galaxy and the rotating spiral structure. In the following section, the large-scale potential energy spiral will be demonstrated to pump out ordinary matter such as interstellar gas and dust to beyond the zonal maximum, creating the observed galactic outflow of gas. It will further be shown that the rotating potential energy spiral bears the effect of �equalizing� the velocity of orbiting matter, resulting in the relatively constant rotation curve observed in spiral galaxies. The critical influence of the rotating spiral on star formation will be examined in the final section of this chapter. Consequently, particles or objects with orbital radii larger than can no longer keep up with and begin to lag behind the rotation rate of the zonal pattern. The pattern speed in this example is given by . It would take the pattern years to complete one full rotation, while a star moving at a speed of relative to the galaxy center in a circular orbit of radius of requires as many as 245.78 million years to complete a full rotation. As shown above, at distances of the spiral maxima and minima rotate faster than the given ordinary object, and therefore overtake its orbit on a periodic basis. When the object�s initial potential plus kinetic energy just prior to an encounter with a rotating maximum contour is lower than its potential energy at that maximum, the potential plus the kinetic energy of the object must be elevated to match or exceed its potential energy at the maximum. In addition, the rotating spiral applies a greater than zero net tangential force on the rotating object along its direction of movement, thereby resulting in a non-zero net work and in increasing the object�s energy with every full spiral rotation.1 Unless the object loses this added energy via other interactions in between successive encounters, its energy level will steadily increase. The object�s potential plus kinetic energy is thus expected to eventually exceed its potential energy at the highest maximum , and consequently the object will exit the galaxy. In figure 6-3, the maxima of the relativistic oscillations beyond decline with increasing distance and cannot confine the object, which breaks free and flies out in the tangential direction away from the galaxy. A collective outward flow of galactic matter may explain the observed large-scale outflow of gas from galaxies. 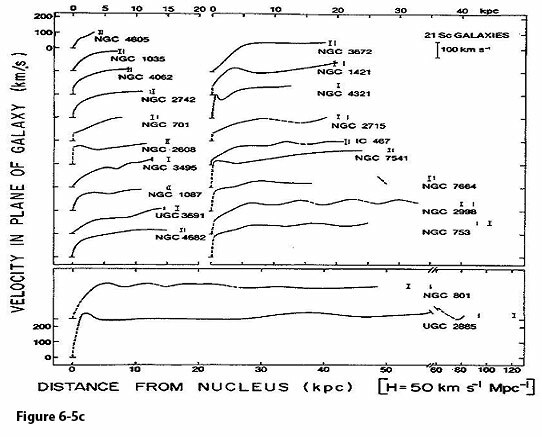 Figure 6-3: Provides the gravitational potential energy along the x axis between an ordinary particle of mass and the binary SHP groups of a galaxy, described by the parameters , , , and . 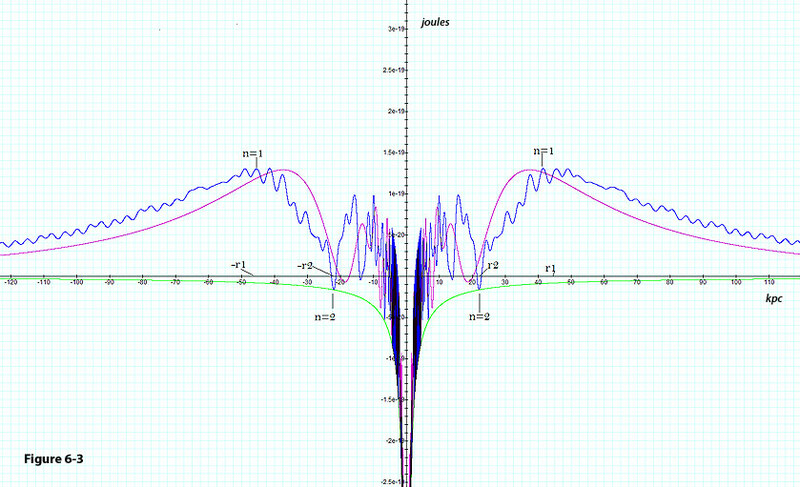 Given non-relativistic SHP velocities of , the potential energy derived via equation 4-1-1a demonstrates a long and steady decline beyond the maximum (in violet) toward the potential energy minimum. However, at a relativistic SHP velocity of , the potential energy (in blue) provides outward propagating oscillations well beyond the external zonal maximum , while the maximum contour shifts outward. This process provides a possible explanation for the mechanism that drives the galactic outflow of gas and determines its velocity. Note that if the galaxy center contains a substantial amount of additional smaller SHPs (at sufficient quantity that their overall mass is larger than or comparable to ), other outflow velocities may be detected. Such a phenomenon is observed in the Solar System, where solar wind is observed to have two different speeds at about and , suggesting significant contribution from at least two different SHP types. Whereas the Newtonian rotation curve of equation 6-4 drops proportionally to , the UG rotation curve of equation 6-1a limits the speed of a rotating object to the range of within the oscillation range of and at distances . Therefore, at relatively short distances5 , and , the rotation curve increases proportionally to , in agreement with observations (see figure 6-5c at distances ). At distances , where and , the velocity of the orbiting object becomes . At distances and , the maxima and minima contours of both SHP groups (in the case of binary groups) almost coincide, and the contribution of ordinary matter is relatively small. Therefore, all the potential energy maxima within this range of distances demonstrate approximately the same potential energy of , and all of the minima within this range have a potential energy of virtually zero joules or electron-volts (note that the external maximum is slightly higher than the rest of the maxima within this range of distances and can thus contain the object within the galaxy). where and . 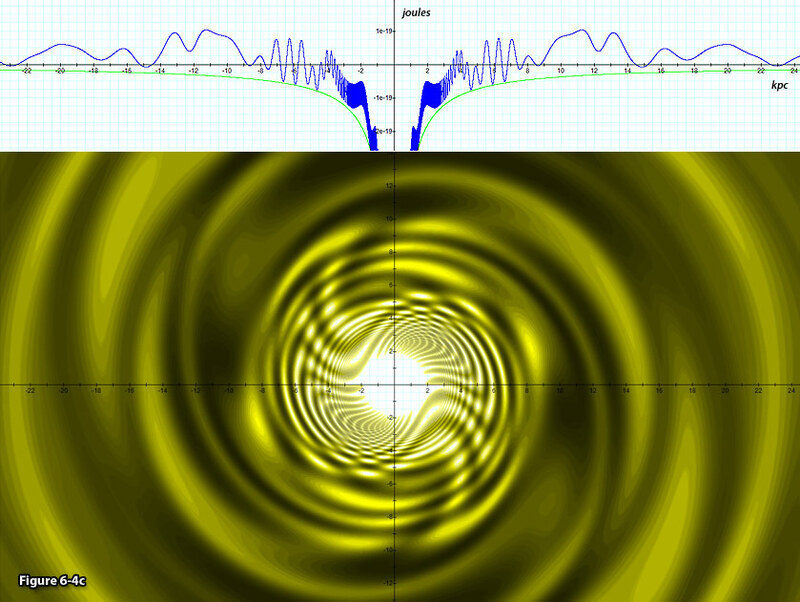 As the zonal spiral rotates, the object encounters an equal number of potential energy maxima and minima. Since matter tends to gravitate toward the minima potential energy, the object spends longer periods of time near the minima than near the maxima or near any other potential energy level in between. For this reason, the density of matter near the minima is far greater than the density of matter near the maxima. Most of the observed radiation generated by the galactic gas is therefore likely to have originated at or near the potential minima locations, where the velocity of the object is given approximately by . Consequently, the spectrum of the radiation emitted by the object�s atoms appears redshifted when the matter moves away from the observer, or blue-shifted when the matter moves toward the observer, and is strongly skewed toward the shift associated with the velocity of the object at the minima . Note that is constant and independent of both the mass of the object as well as its distance from the center of the galaxy. As the minima are generally circular, the velocity of the object is almost tangential. Therefore, the spectral redshift or blueshift at the large distance range observed is of a relatively flat velocity curve. Figure 6-4c:Depicts a two dimensional contour map of the same galaxy provided in figures 6-4a and b, where the brighter colors denote lower potential energy of the test object. where . As aforementioned, for distances or , the velocity of the object is given by . 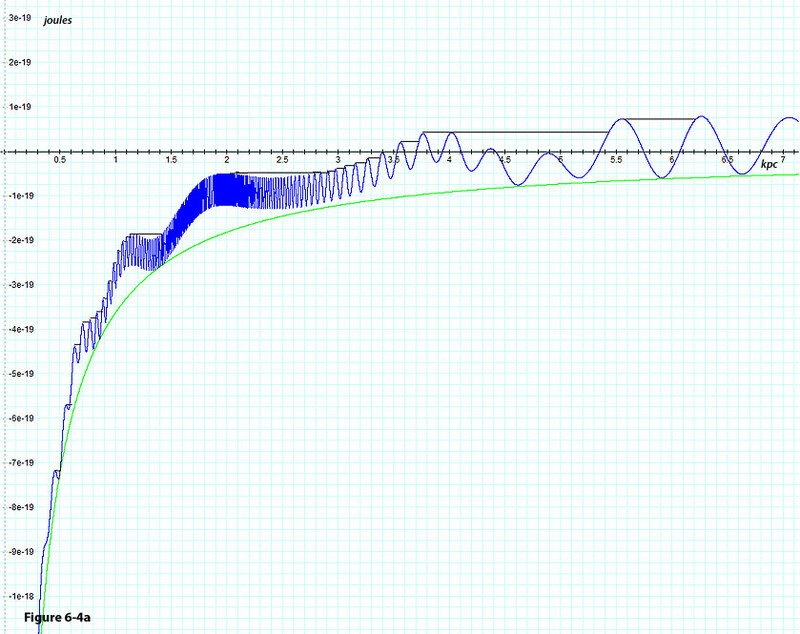 Due to this concept, the rotation curve of the modeled galaxy was calculated by subtracting the potential energy waveform (the blue curve) from the potential plus kinetic energy waveform (indicated in black) displayed in figures 6-4a and 6-4b. Based on the above discussion, the overall potential plus kinetic energy is determined mainly by the highest maxima encountered prior to the given point in time . As long as no higher maximum is encountered, the energy of the particle will increase only slightly with each rotation of the spiral, thus remaining nearly constant. However, upon encountering a higher maximum , the potential plus kinetic energy of the object will increase to the level of , as demonstrated by the series of black lines in the figures. The calculated radius and potential energy of the maxima and minima shown in figures 6-4a and 6-4b are respectively provided in the columns x, and of table 6-1. The Delta column of the table provides the approximately calculated kinetic energy of the object upon encountering the minima of the spiral, given by , and the column provides the Newtonian potential energy of the galaxy�s ordinary matter (indicated in green in figures 6-4a and 6-4b). Bear in mind that the waveforms and the two dimensional map of figures 6-4a to 6-4c (and therefore the set of values and in table 6-1) were calculated under the assumption that each group contains a single SHP, and that the total mass of ordinary matter in the galaxy is concentrated mainly in a sphere of radius . 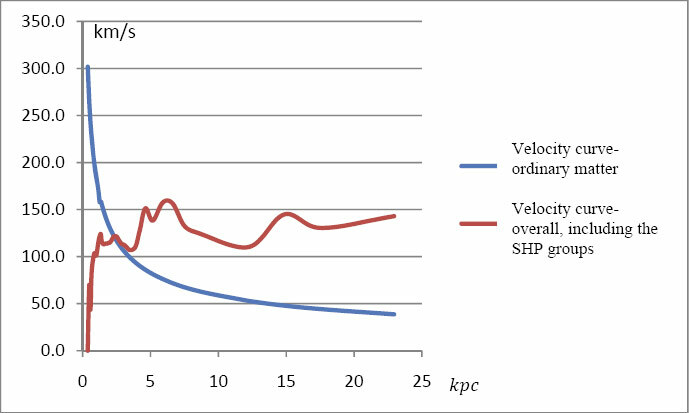 According to equation 4-1-1a (as well as to the second scaling theorem of the UG theory provided in appendix A), galactic morphology will remain unchanged as the number of superheavy particles in each SHP group and the mass of the ordinary matter are multiplied by the same value , while the potential energy and velocity of the object increase by a factor of and respectively. For example, selecting will result in a total of superheavy particles, and an overall ordinary matter mass of . With this choice of , the galaxy rotation curve expected according to Newtonian dynamics via equations 6-4 (multiplied by ) and the overall UG rotation curve (which includes both the contribution of the galactic SHP groups and the contribution of ordinary matter calculated via ) are provided in the last two columns of the table. Note that the calculated velocities include a radial component as well. However, the assumption that the object�s orbit is nearly circular implies that its rotational velocity is nearly equal to its overall velocity. Figure 6-5a: The galaxy rotation curve within the disk range of distances between to ( axis) and velocity between and (on the axis). 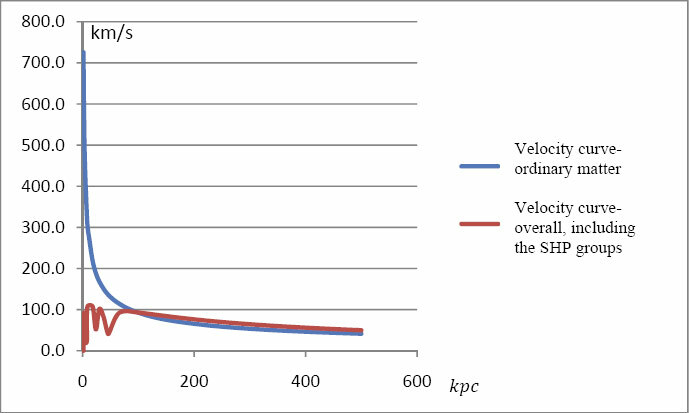 Figure 6-5b: The velocity curve of a galaxy similar to the one provided by figure 6-5a, where increases from to . The x axis provides the distance from the galactic center between and , and the y axis provides the object velocity between and . Figure 6-5c: Measured mean velocities in the plane of the galaxy, as a function of linear distance from the nucleus for 21 Sc galaxies, arranged according to increasing linear radius. The curve drawn is a rotation curve formed from the mean of velocities on both sides of major axis (Rubin, Ford & Thonard, 1980). The general trend is of rapid velocity rise to at about , and slower rise or close to constant velocity thereafter. Figure 6-5a provides the distance range between and . Within the range of , the UG rotation curve demonstrates an initial sharp increase in the velocity of the test object from to about . At roughly to , the rotation curve levels and displays few oscillations within around an average velocity curve of about , yet overall remains level relative to the sharp decreasedemonstrated by the Newtonian rotation curve, which reduces proportionally to . In addition, the approximately constant rotation curve increases slightly with distance, in good agreement with observation, as shown in figure 6-5c.10 As demonstrated by figure 6-4b, the rotational velocity is not isotropic within the galaxy, and is dependent on the object�s azimuth. A second example is provided in figures 6-5d and 6-5e for a galaxy with similar parameters, containing of ordinary matter (rather than ).11 Due to the increased mass of the ordinary matter, the test particle remains trapped within the galaxy even when its potential plus kinetic energy is equal to its potential energy at the maximum. As demonstrated, the encounter with a higher potential energy maximum abruptly elevates the potential plus kinetic energy level of the test particle. The particle�s potential plus kinetic energy (indicated in black) remains almost constant at this level, demonstrating only a slight increase due to the rotation of the spiral, until the next encounter with a substantially higher potential energy maximum. Similar calculations lead to the rotation curve of the second galaxy displayed (for a given azimuth) in figures 6-5b. There are a large number of possible combinations of SHP and ordinary matter parameters. The rotation curves of spiral galaxies therefore do not conform to a universal form, and different combinations may result in a different rotational curve. However, at distances , where the central rotating spiral is sufficiently strong relative to the influence of the gravitational field of the galactic ordinary matter, the velocity curve of the galaxy will remain flat relative to the Newtonian velocity curve. In summary, the UG theory is demonstrated to provide a constant velocity curve in spiral galaxies that is consistent with observations, without the need to assume the presence of yet undetected dark matter. Rapid SHP rotation may have the effect of converting star formation from a one-time event, by which thousands to hundreds of thousands of stars are formed at static minimum points, into a production line which over time creates more than stars. In the case of SHP rotation, at distances of , orbiting matter can rotate at the same angular velocity as the rotating central core and its SHP groups, and can therefore keep pace with the rotating pattern. Hence, as in the static SHP scenario, at these short distances the stars remain confined to their place of birth within the galaxy. Consequently, the number of stars is limited by the number of minima intersections. However, as the SHP groups rotate around the galaxy center, at distances their zonal pattern rotates too fast for the newly generated stars to keep up, and the new stars begin to lag behind. As the zonal pattern continues to rotate, leaving behind the newly formed stars, its minima are shifted to nearby locations containing fresh interstellar gas. The accretion of matter at the new minima locations initiates a series of additional collapses, and a new set of stars is generated. This process is repeated with rotation, and by the time that the SHP groups have completed a full orbit around the galactic center, returning to their original positions, the stars created previously at these minima locations are expected to have relocated and to have been replaced with fresh interstellar gas, allowing the process to repeat all over again. The mechanism underlying the migration of stars away from their place of birth is as follows: As the minima of the pattern rotate away from the stars formed within them, the minima are replaced by their adjacent maxima contours. As these maxima cross paths with the slower moving stars, they elevate the overall potential plus kinetic energy of the stellar systems to match or slightly exceed their potential energy at the maxima. As the pattern continues to rotate faster than the orbiting new stars, the maxima contours move away from the stars� initial areas of formation, thus converting their elevated potential energy into kinetic energy, thereby accelerating them away from their original positions. Consequently, by the time the following minimum arrives at a given location of star formation, the stars produced in the previous cycles have moved away from their original coordinates, vacating the area for an inflow of fresh interstellar gas, ready to collapse into new stars. This process may continue for as long as a new supply of interstellar gas and dust is available. As will be shown in Chapter VII, a constant supply of interstellar matter is expected to be available until the superheavy particles generated at the galactic core become sufficiently massive to �lock� the galaxy, or to severely restrict any further inflow of ordinary matter. Figures 6-6, 6-7 and 6-8 provide the potential energy of a test object in a galaxy using equation 4-1-1a with the set of parameters , , , , , and . 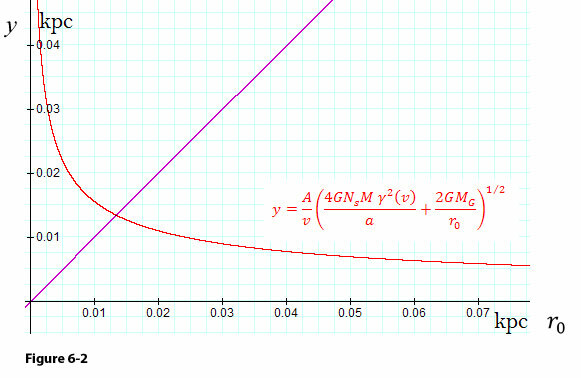 Figure 6-6a: Provides the potential energy of an ordinary particle of mass along the x axis (which passes through the binary SHP groups of a galaxy) is described by the parameters , , , , , and of equation 4-1-1a. A high density of minima is demonstrated to occur between approximately , at which a large number of small stars are expected to be produced. In areas with a low density of minima, as observed deep in the galaxy center at , or at , the amount of matter collapsing toward the minima is greater, resulting in the creation of larger, but fewer stars per volume of space. At distances , minima and maxima cease to exist, allowing matter to collapse into a possible black hole. Figure 6-6b: Displays the same galaxy at a later time, where the rotated axis becomes aligned perpendicular to the line connecting the two SHP groups. As the axis is located relatively far from the two SHP groups (the closest points are away from either SHP group), the number of minima per volume of space along the axis decreases, resulting in the production of fewer, yet more massive stars within the range of At this orientation, when confined to the axis, maxima and minima cease to exist below about . Figure 6-6a provides the potential energy of the object when the axis is aligned with the two SHP groups positioned at (or at about to from the plotted horizontal axis of figure 6-7). As the displayed axis passes through the two SHP groups, the figure displays a high density of minima between approximately , where a large number of relatively small stars are expected to be produced. In areas with a low density of minima, as observed deep in the galaxy center at , or at , the amount of matter collapsing toward each minimum is relatively greater, resulting in the creation of larger, yet fewer stars per volume of space. Figure 6-6b displays the same hypothetical galaxy at a later time, where the rotated axis becomes aligned perpendicular to the line connecting the two SHP groups. 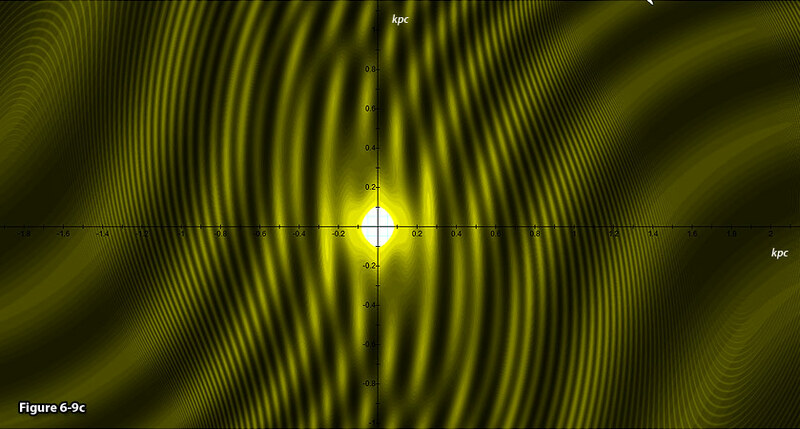 As the distance between the axis and the two SHP groups increases (the closest points are away from either SHP group), the number of minima per volume of space along the axis is reduced. Closer to the center of the galaxy, at ,13 the slope of the potential energy due to the contribution of ordinary matter in the galactic core becomes greater than the contribution of the SHP group, and the oscillation maxima and minima appear washed out.14 Consequently, the matter below roughly can collapse toward the center of the galaxy, where no fragmentation can occur, and the spiral cannot reach this area. In this model the spiral begins at approximately , thus matter below this distance cannot be carried outwards by the spiral. The same observations become clear in the two dimensional maps of the same galaxy provided in figures 6-7, 6-8 and 6-9, where the brighter colors denote lower potential energy of the test object. The SHP groups located within the area indicated by the white arcs15 are located near the tips of the bar and create an �interference� pattern of bright (minima) and dark (maxima) regions. As the SHP groups and their resultant zonal patterns rotate, matter in the vicinity of the maxima gravitate toward their nearest minimum, creating sufficiently high concentrations of matter to trigger a collapse in each of the minima. The size of a minimum, and to some extent its location, determine the amount of matter that may be enclosed in its vicinity, and therefore the size and the mass of the resultant star. In order to obtain a more detailed analysis of the distribution of stars deep inside the galactic bulge, the mass of the ordinary matter was reduced to (approximately 3,000,000 times the mass of the Sun). The resultant figures 6-9a to 6-9c provide two dimensional maps of the galaxy center with the following parameters , , , , , and , viewed in different resolutions at various locations within the center of the galactic disk. Figure 6-7: Depicts a two dimensional contour map of the same galaxy provided in figures 6-6a and 6-6b, where the brighter colors denote lower potential energy of the test object. Figure 6-8: The same galaxy displayed in figure 6-7 is shown in higher resolution, where the locations of the SHP groups are indicated in white and the approximate area of the galactic bar is indicated in red. Note that a majority of the stars are produced in the general area of the tips of the bar, as the immediate areas surrounding the SHP groups are fragmented into many isolated clouds that may be too small to collapse. Figure 6-9a:Displays a two dimensional contour map of a similar galaxy with a reduced mass of ordinary matter, using the parameters , , , , and . Brighter colors denote lower potential energy of the test object. As can be seen, the SHP groups located within the area indicated by the bright arcs and are located near the tips of the bar and create an �interference� pattern of bright (minima) and dark (maxima) elliptical or arc regions. As the SHP groups and their resultant zonal patterns rotate, matter accumulates in the vicinity of the minima, thereby creating dense molecular clouds that collapse and create stars. Filaments occur in the long bright arcs near the central bulge. 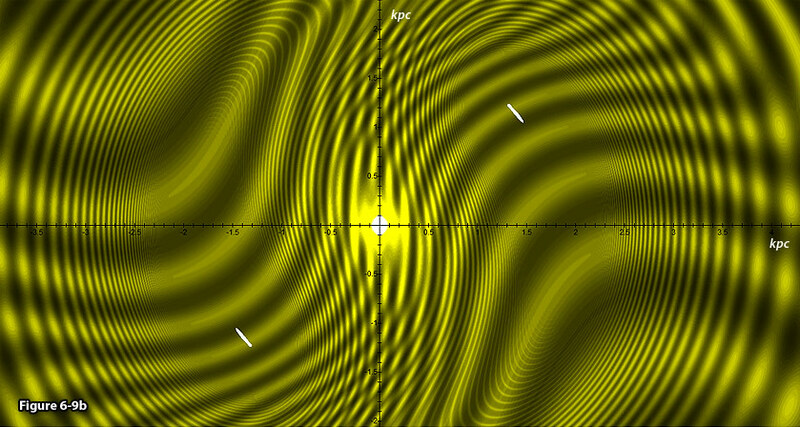 Note the pattern of a bar within a wider set of rings at the center of the figure. Figure 6-9b: Provides the same galaxy as figure 6-9a displayed in a higher spatial resolution. Figure 6-9c: Further increasing the resolution to concentrate on the central bulge displays a central bright area containing the rotating core of the galaxy (which may possibly be a black hole). The increase in the size of the stars as they approach the central core is apparent. As aforementioned, with the exception of the region surrounding the central core at , the minima are contained within the brightest areas of the figure. The geometry of the bright areas can be divided into elliptical regions, circular regions and arcs. The arc formations bear a strong resemblance to the patterns of observed filaments. All three geometrical patterns indicate regions that may either collapse into a star or produce dense molecular clouds or nebulae. The mass of a star can be expected to grow with the size of the area enclosed within the vicinity of its potential energy minimum. A filament is likely to be created in areas containing long continuous bright arcs.16 As previously discussed, the bright segments, or arcs, reduce in size and increase in number with increasing proximity to either one of the SHP groups. The existence of long arc regions may explain phenomena such as the filaments observed within galaxies and nebulae, as well as molecular clouds. Note that certain parallel sets of (bright) filaments resemble the structure of the Pillars of Creation of the Orion Nebula shown in figure 6-10. Also worth mentioning is the approximately circular string of about 6 to 8 large stars produced at distances of about to from the center of the galaxy. In general,three types of rings are often observed in barred galaxies: nuclear rings, with radii of about , elliptical inner rings of few kiloparsecs in diameter, which align and connect with the central bar, and outer rings, with radii of approximately 1.7 to 2.2 times the radius of the inner ring. It has been suggested to identify the nuclear rings with the inner Lindblad resonance, the outer rings with the outer Lindblad resonance, and the inner rings with either the corotation resonance or with higher orders of the inner Lindblad resonances. However, observational data has not yet confirmed these claims. Note that figures 6-7, 6-8, and 6-9a to 6-9c provide rings that fit beautifully with these observations. However, in the calculated images, each of the three classes of rings includes several nearly concentric rings at very close proximity to each other. 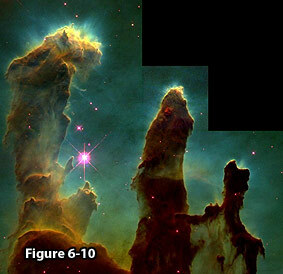 Figure 6-10: Pillars of Creation in the Eagle Nebula. Image credit: ESA/NASA; http://hubblesite.org/gallery/album/pr1995044a. Interestingly, looking further into the center of the modeled galaxy, figure 6-11a provides a calculated image that resembles characteristics demonstrated by the central region of the Milky Way, provided in figure 6-11b, where Sagittarius A is likely to be the central rotating core. 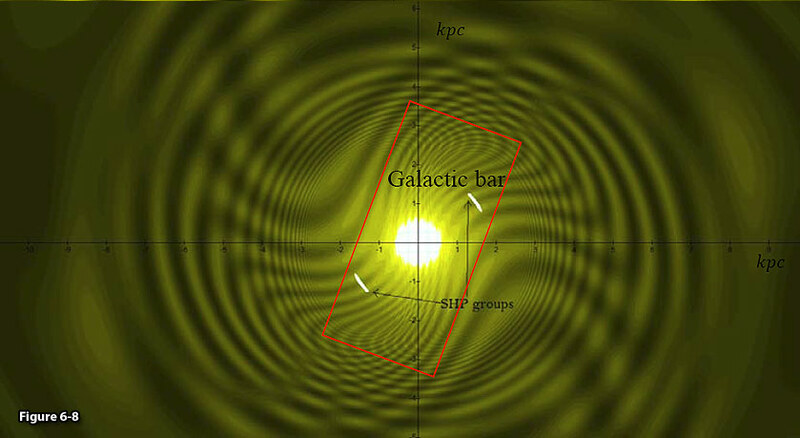 Figure 6-11:Zooming further into the center of the model galaxy (calculated in figure 6-11a) provides an image that resembles the characteristic demonstrated by the radio image of the central region of the Milky Way Galaxy depicted in figure 6-11b. The circular structure on the bottom of the right image may possibly indicate either a supernova remnant, or a ring around a superheavy particle group in orbit around Sagittarius A. Image credit for figure 6-11b: N.E. 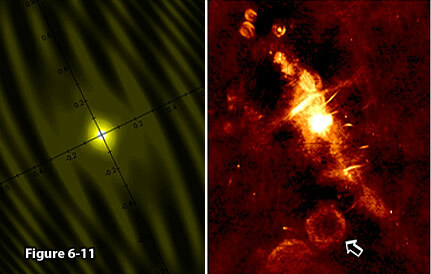 Kassim et al., Naval Research Laboratory, NRAO/AUI/NSF; http://www.nrao.edu/pr/2005/newsource/. 1 This results from the assumption that the object does not rotate in the opposite direction of the spiral. In the case where the object and the spiral rotate in opposing directions, the spiral will initially slow down and halt the object�s rotation, before accelerating it in the opposite direction. From that point on, the energy of the object will begin to increase. 2 indicates that the vast majority of the galaxy�s ordinary matter is contained within its core and within the galactic disk. 3 The remaining of the missing mass is believed, according to the current leading paradigm, to consist of dark energy. 4 The leading alternative theory of Modified Newtonian Dynamics, or MOND, is provided by Milgrom, M. 1983. ApJ., 270, 371; Milgrom, M, Braun, E. 1988. ApJ., 334, 130; McGaugh, S.S. and Blok, W.J.G. de. 1998. ApJ., 499, 66; Blok W.J.G de, McGaugh, S.S. 1998. ApJ. 508, 132;Begeman, K.G, Broeils, A.H., and Sanders, R.H. 1991. MNRAS, 249, 523; Sanders, R.H. 1996. ApJ., 473, 117; and Sanders, R.H., Verheijen M.A.W. 1998. ApJ., 503, 97. Non-gravitational acceleration of halo gas rotation (due to magneto-hydrodynamical force) was also suggested as an alternative by Nelson, A.H. 1988. MNRAS. 233, 115. 5The dependency of on can be derived by assuming a homogenous spherical distribution of for , and for , where the density of the ordinary matter ρ is assumed to be constant. 6 Note that this discussion assumes that the effect exerted on the given object by other orbiting objects is relatively small. As will be shown in Chapter VII, this assumption does not necessarily hold true for the case of elliptical galaxies. 7 Note that when a series of graphs separated by a short time interval were calculated and displayed in rapid succession as a movie, the waves of figures 6-4a and 6-4b traveled outward, while the two dimensional map rotated counterclockwise, displaying spirals that converge outward. 8 The slight positive slope is a consequence of the small increase in the object energy due to the work done by the spiral rotation. 9 Note that as demonstrated by figure 6-4c, the potential energy is not rotationally symmetric, and may vary with the azimuth. Therefore, the velocity curve may also vary with the azimuth, in agreement with observations. 10 Note that a choice of , rather than , would have resulted in the maximum velocity of about , which is closer to the range of velocities demonstrated by Andromeda. Also note that according to table 6-1, the velocity curve between and about is reduced significantly. However,while the theoretical velocity curve demonstrates a rapid decline at (for this example), the density of matter within this range of distances reduces significantly beyond the minimum at about . Therefore, beyond the distance of , the velocity curve begins to decline towards the outermost maximum, where its velocity nearly reduces to the Newtonian velocity. At this point, the object escapes the galactic disk. As the minima within the range of distances between and are shallow and relatively far from each other, the velocity curve in this distance range is less detectable. However, the constant rotation curves of some spiral galaxies were observed to end with a detectable sharp reduction in velocity, as demonstrated in the case of the velocity curves of NGC 2885 and NGC 7664 displayed in figure 6-5c. 11 As this example uses , the overall mass of the galaxy�s ordinary matter is . 12 In accordance with the UG stellar model, in 2008 Yusef-Zadeh and colleagues announced evidence of very young stars in a ring of gas near the heart of the Milky Way Galaxy. The researchers observed strong radio emissions from natural molecular masers, which form within dense collapsing clouds. The presence of these masers suggests that gas is collapsing to form protostars, which will eventually form into stars that are tens of times heavier than the Sun. In addition, these protostars share the same space with older stars (see Courtland, Rachel (July 23, 2008). �Stellar Nursery Found Near Milky Way�s Violent Heart.� New Scientist, http://www.newscientist.com/article/dn14390). Some stars were observed further in toward the galaxy center, only two light years away from Sagittarius A, currently believed to be a massive black hole. Sagittarius A is thus a likely candidate to be the rotating central core of the galaxy. 13 The parameter denotes the radius of the central core, where the vast majority of the collapsed ordinary matter resides. 14 Note that if one of the SHP groups was located at the center of the galaxy, , its maxima and minima would either disappear everywhere, or would exist anywhere, as long as . However, since both of the SHP groups are located at a distance from the center, their maxima and minima may be diminished close to the galactic center relative to the influence of the ordinary matter. 15 These areas appear white since the spatial oscillations became extremely dense to the point of overwhelming the display resolution, and were simply averaged out by the graphical program used. 16 Note that while some of the segments displayed in the figures form genuine arcs, some of the longer, apparently continuous bright areas in the vicinity of the SHP groups are not actually continuous, but instead contain large numbers of distinct circular regions and arcs that are too small to appear separated. Zooming the display can help distinguish between the two possibilities (for example, compare figures 6-7, 6-8, 6-9a, 6-9b and 6-9c).